Ah yes, the dreaded recalls. Even when doing your due diligence by calling companies and reading ingredient labels, recalls can occur and cause a life-threatening reaction. This is why even when you’re trying your hardest, you have to remember that you can’t control everything, and there is always a slight chance of some type of cross-contamination. I say this for a few reasons. First, because it’s true. As we all know, we can’t control everything, so just trust that you are doing your best. Unfortunately, someone reacted to a product they thought was safe, and that is what caused the contamination to be known, and the ‘voluntary recall’ to occur. Lastly, if you feel a reaction coming on, please don’t treat it lightly. I’m not saying to go to the ER immediately if you feel slight symptoms, but it’s good to try to remain calm, to try to decipher if a reaction is actually happening, or if it could be anxiety, environmental allergies, or something else. If you are an allergic individual reading this, if I feel a potential reaction, I always try to tell others around me so I’m not alone in knowing. Recalls can occur a number of ways. It could be in a specific facility if peanuts are present but segregated and it can also happen in peanut-free facilities, where the individual ingredients coming into the facility are contaminated with peanut residue. 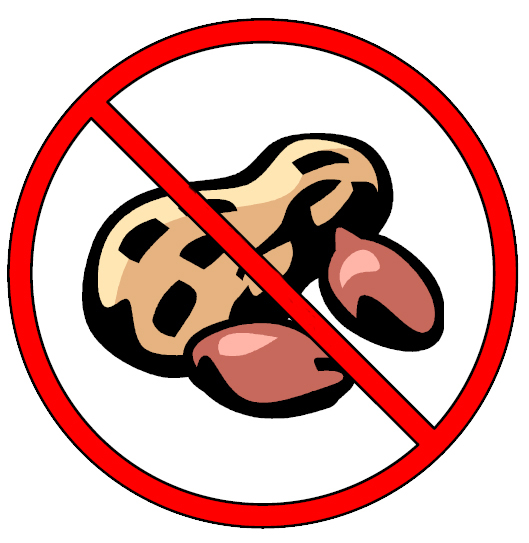 I personally avoid items made on shared equipment with peanuts, and I normally avoid products even in the same facility, just because the chances for a reaction are higher, but it is nearly impossible to know the source of each ingredient in a peanut-free facility, and where it came from and was grown, and how it was stored there, distributed, etc. A company I love, one that does an excellent job with labeling, Clif Bar & Company, recently issued a recall for a few of their products containing chocolate for potentially containing tree nuts or peanuts. I am not sure how the nut contamination took place, but it made me reconsider starting my morning off with 1. something highly processed, and 2. something made in a facility, when I could just be making a fresh smoothie each morning. Something fresh would be more healthy, and way less risky. I appreciate having pre-made snacks and meals that are “safe” (I try to use this word lightly for obvious reasons) but I also know I need to try to limit them, and use them more sparingly. Vacations, roadtrips, long days away from home, long car rides, those are times it’s completely acceptable to eat them, but when I’m home all day enjoying a lazy Saturday, I don’t need to start my day off with a Chocolate Salted Caramel Protein Luna Bar (my favorite flavor). My personal goal is to try to eat more fresh, less risky foods that weren’t produced in a facility someplace. However, below you will see there is a caveat to that as well. Throughout 2017, there has been a national flour recall for peanut contamination stemming from a company called Grain Craft. This was extremely problematic because they don’t sell to people like you & me individually, they are a flour provider for the foodservice industry, the supplier for entire companies, such as Kellogg’s. Like any product recall, such as the current car airbag one that is involving many different car manufacturers that purchased the Takata airbag, it can be very widespread. Special K, Keebler, Pringles, Pop-Tarts, Kashi, Cheez-It, Eggo, Nutri-Grain, Morningstar Farms, United Bakers Group, Egyptian Expansion, Famous Amos, Bear Naked, Gardenburger, and a bajillion others. I don’t eat much Kellogg’s stuff, besides Morningstar, which has just been hard to give up, mostly because they are not respectful to the allergy community. They don’t label for ‘may contain’ or give information on shared equipment or facilities, and since it isn’t required in the U.S., I can’t blame them. However, they did start putting peanut flour in products SOLELY to make it so that people would quit asking them to label for the top 8 allergens. The company controls an ENORMOUS chunk of consumer food products, in my opinion it should be illegal to be this large, and as you can see, their values for its consumers are truly atrocious. Shifting back to Grain Craft, the recall involved a Frito Lay product, Rose Gold pretzels. These are known to be safe for peanut-allergic individuals, so this was very important to spread the word about. I am very passionate about raising awareness on the lack of standards in the United States surrounding food labeling, and recalls are one thing that it’s important to continue to be aware of, but even with good labeling, reactions to undeclared allergens can still occur. I do believe recalls would be caught much faster here if corporations were more aware of their ingredients, and required to label for ‘may contain’, but it wouldn’t eliminate the problem fully. In fact, in this case, it turns out Grain Craft has actually never used peanuts in their facilities. It was that the wheat they purchased was grown in areas with peanuts in Georgia, so it was contaminated at the growing source, prior to getting to their mill in GA. This fact was particularly scary. I attached a link here about the recall. As you can see, this also goes against my idea of fresh food being safe, and causes me to emphasize that you can never be 100% sure of ingredients. I am now adding peanut-growing states in the South to my list to be wary about, not that I wasn’t already, but sheesh! My next post will be more on this topic. Including how to garden at home safely, compost including peanut residue, states that grow peanuts, and more. Below is an infographic I found here that shows 10 major corporations, and the brands they own. I actually don’t think this even includes ALL their brands, or is the most up-to-date because I see a few missing such as Enjoy Life the allergy friendly brand owned by Mondelez.